Features you and your donors will love! Txt2Give is leading the way in the mobile donations space with it's powerful text giving platform. Here are some of the features you can expect when you use Txt2Give. Txt2Give is a fantastic way for people to give right away at the moment of inspiration. We recently raised enough money to send 150 low income kids to the fair. It was AWESOME! 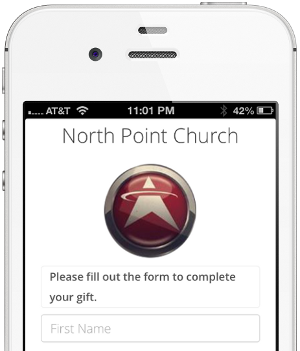 We make it easy to allow your donors to send in their mobile donations without even having to think about it! 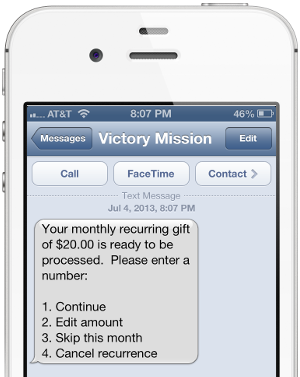 Txt2Give is the only text giving solution that offers recurring donations right in the text flow. It's incredibly easy to set up. During the normal giving process, your donors will be asked if they would like to set up a weekly or monthly recurring gift. Once the recurrence is set up, they will receive a text when the gift is ready to be processed. All they have to do is confirm it. It doesn't get any easier than that! After first-time donors confirm their donation, they sometimes may not immediately register their credit card info with Txt2Give. Maybe they don't have it with them at the time. Maybe they got distracted. Whatever the reason may be, our service has you covered. Txt2Give will automatically send a reminder text to the donor after two days if the donor hasn't registered their credit card. Take that, forgetfullness! After first-time donors confirm their mobile donation, they will be directed to a short form where our system will collect information such as name and credit card details. This form will be branded with your organization's name and logo so the look and feel is consistent with your organization's brand. Don't like manual entry of donations? No problem! Our integrations will allow your Txt2Give donations to flow effortlessly into the systems and databases you already use. We offer these integrations below, with more on the way. Want us to support an integration not listed below? Ask if we can build it! 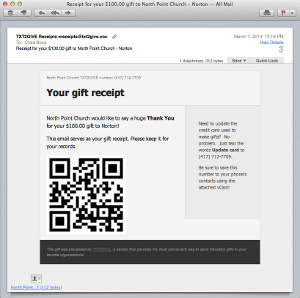 One easy way to market Txt2Give to your donors is by using a QR code. Upon signing up, your organization will receive a unique QR code that can be put on marketing materials. 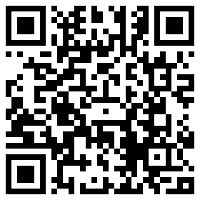 This QR code has your organization's Txt2Give number embedded within. When a donor scans the code, a text message will automatically pop up on the donor's phone with the your Txt2Give number and the word Give to help them start the donation process. It doesn't get any easier than that! Once a week you will receive a summary report of the weeks donations delivered right to your email inbox. 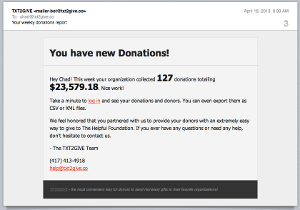 This is a great way to keep tabs on your donor activity at a glance. This is your view into the details of your donors and their activity. 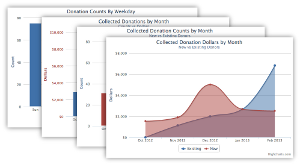 View detailed anaylitics at a glance on the Dashboard, like conversion rate, average amount donated, donation counts vs dollars, and more. Donor and donation details are all exportable. It's your data. Use it however you want. After every donation, an email receipt will be emailed to the donor. Included in the receipt will be your organization's unique Txt2Give number and convenient vCard, so they can easily save the number to their contacts. The next time they want to donate, they can simply click the saved contact and start giving. Copyright ©2012-2019 Txt2Give. All rights reserved.